I remember the first time I heard Lou Reed & The Velvet Underground as I was sitting on my friend Rob’s couch. It literally made me sit up, turn toward the stereo and ask Rob who that was. I needed to know. The music grabbed me instantly and I was converted. The Velvet Underground was a bit before my musical time but I turned to Lou Reed’s solo career and to this day, still listen to his music regularly. I am still moved. I also remember the day he died. I had just missed a concert by one of my favorite performers the day before because I was just too busy or tired or some other excuse for not driving an hour to see her. The next day when I heard that Lou Reed had passed away, I felt like a piece of me had been ripped out of my chest and my breathing honestly felt a bit strained. Mentors and influencers appear and move in and out of our lives. 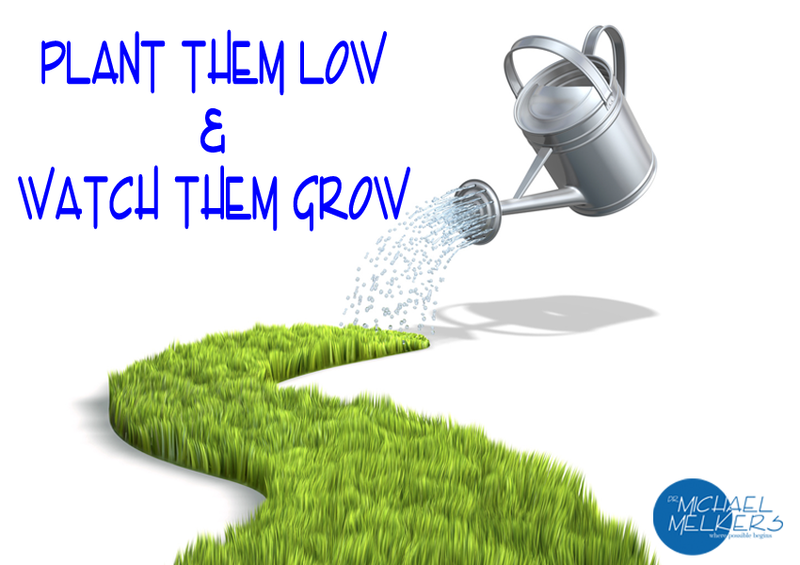 There are times that we ‘outgrow’ the influence of our mentors. That is one way to look at it. There are times that the culmination of influence of our mentors lifts us up to a higher level, purpose and calling. We do not ‘outgrow’ them but rather flourish under their influence and knowledge nurturing that it becomes time for our own evolution. Parker Palmer in The Courage to Teach speaks of phases in our growth that the need to mentored is diminished and the opportunity to mentor reveals itself. Unrealized, this juncture can be experienced as a plateau or even professional burnout. Yet, if we can turn and recognize that opportunity-to nurture and influence others, to pass on that magic that was shared with us, we can pass through that dubious plateau or burnout phase. 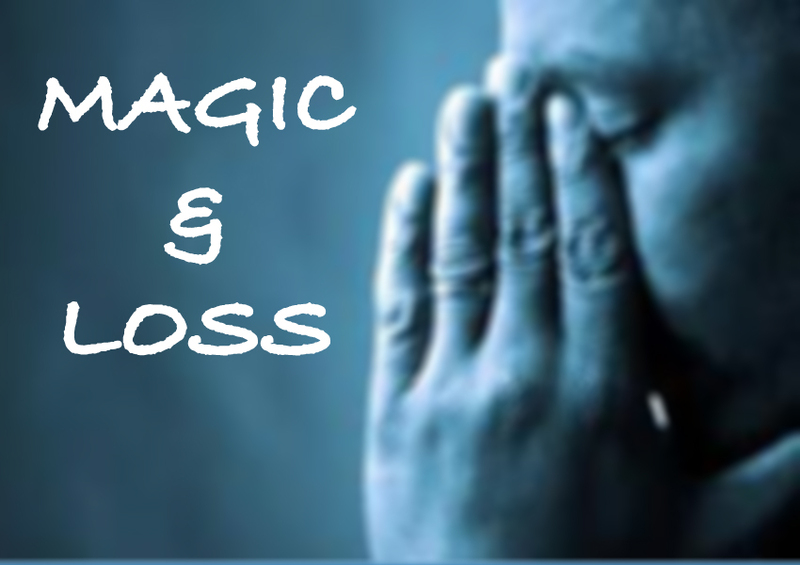 That ‘magic’ is a gift that can grow exponentially within us and those that we influence. As we reach the halfway point of 2016, I have seen too many of my mentors and influencers pass on this year-be it David Bowie, Russell DeVreugd or Dr. Dennis McCullough. I think of the lost opportunities I had to spend more time with Russell as I was not and do not think would ever be finished needing his guidance. If only I had made the time to get together again at the bench. I think of the missed opportunity I had to contact Dr. McCullough, introduce myself and share the impact that his teachings & philosophy has had on my own life, my teaching and patient care. If only I had made that call or written that letter. I look back at those opportunities lost-if even for one more chance. Their influence remains but that piece of my chest is still missing. It has been filled though with their memories, lessons and impact. I look forward now to new opportunities realized-to pass from the receiver of their influence to the one that shares it forward to the next recipient, colleague or mentee. That is the Magic & the Loss. That is the current mantra of modern treatment planning in dentistry. It clarifies a methodology down to something so basic and easy to follow. The application & rationale certainly require a bit more explanation and exploration. There is simple rationale for starting with the upper single central incisal edge in our treatment planning. The midline and incisal edge together are the cornerstone of the smile. From an aesthetic standpoint, if we start anywhere else, we risk loss of space, symmetry and starting the whole process over again. Eventually we may or will get there-maybe and with lots of effort and potential repeating of the process. This has been exemplified through Dr. Frank Spear’s FGTP (Facially Generated Treatment Planning), more recently Dr. Christian Coachman’s DSD (Digital Smile Design) but really goes all the way back to the Hanau Quint and the fundamentals of denture setups. This rationale however goes past aesthetics and can also facilitate efficiency in planning ‘fit’, while maintaining the aesthetics that we achieved in the ‘looks’ planning stage. The maxillary incisal edge placement is designed in location through aesthetics and phonetics. In fact, phonetics becomes the first component of ‘fit.’ If we like the looks but the patient cannot talk, that really is fit issue that must lead to altering of that sacrosanct edge. It may only be a bevel or labial~lingual inclination. In some cases it may be length. After that has been accomplished-the melding of aesthetics and speech, any changes made to the maxillary incisal edge are at the expense of the aesthetic goal. Consider the edge placement at this point sacrosanct. Next-we truly move to fit. Traditionally this has been the occluding contact of the lower incisal edge against the palatal surface of the maxillary central incisor. There are pitfalls in this approach that I will get to but let’s first explore a different approach-which is the outside~in approach to occlusal design & equilibration. The second step involves matching the mandibular incisal edge to our desired maxillary incisal edge. Porcelain is said to live and die on the incisal edges…and the transition to and from those edges. That is an issue of distribution of forces along a flat receiving area and the resistance encountered getting to and leaving that receiving area. So matching the lower incisal table to the existing maxillary table that we designed provides that distributed, axially loaded force (as much as possible) of parafunction. From that edge to edge position, we move ‘outisde-in’ off of the incisal table and towards MIP. The next contact that we encounter/transition to is over the inciso~lingual edge of the maxillary central-also called the ‘leading edge.’ This is possibly the most overlooked occlusal contact area but arguably the most critical when we look at porcelain failure. If that transition is not smooth or if the contact area in that transition is to concentrated on one small area, failure can and will occur. The leading edge then is matched to the leading edge of the mandibular central incisor-which is the inciso~facial edge or bevel. It has been my experience that spending time & attention to refining the tables to this edge transition will significantly reduce you porcelain chipping and fracture. From that edge transition, we can continue the outide-in journey along the palatal surface of the maxillary central incisor and finally to the leading edge of the mandibular incisor defining the MIP occluding contact. The maxillary incisal edge defines the mandibular incisal edge. The mandibular & maxillary leading edges are defined and matched. The transition between incisal tables & leading edges are refined. The excursive contacts are maintained outside-in which finally defines the MIP palatal contacts. The mandibular leading edge is matched to the MIP contact-sound good. The mandibular leading edge defines and refine the excursive contacts as we move toward the maxillary incisal edge. Looking good. The mandibular leading edge reaches and defines the maxillary leading edge-still seems to be working. Then we get to the tables. 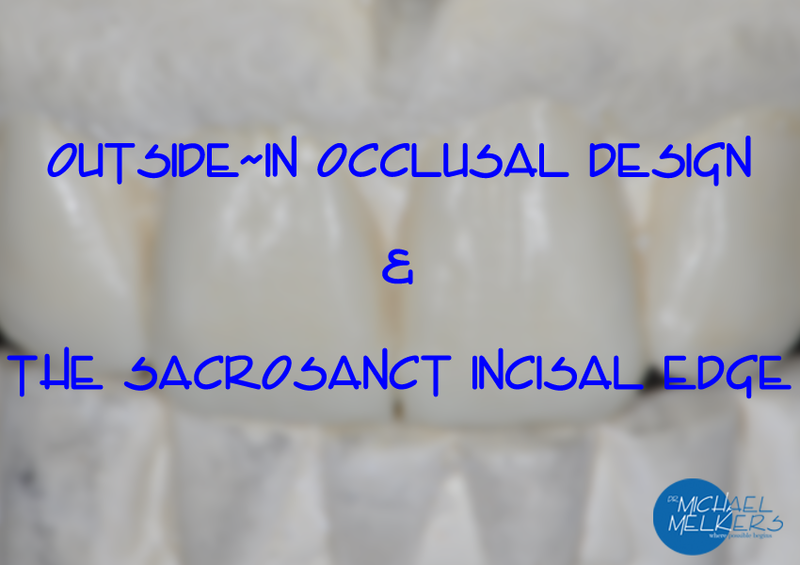 As we transition to matching the mandibular table to the aesthetically defined maxillary edge, do they match. If not what do we do? Do we change the maxillary edge? Well-that could change our desired aesthetics. So-that would lead us to adjusting the mandibular table. Does that adjustment affect the mandibular leading edge? If that is the case then all of the work we did in our inside-out excursions may or will need to be redone. Back and forth the process goes. Inefficiency. Of course-there is also the possibility in the above scenario that we began with ‘fit’ and did not even set that maxillary edge first. Then we would be performing that inside-out occlusal design first then our incisal edge would either be compromised by the plane of the mandibular incisal edge. Or-we go through the whole inside-out process, then we set the maxillary incisal edge. Again-all of other contacts would likely need to be altered. I hope that this helps clarify or at least shed some light on the advantages of an outside-in approach and the sacrosanct nature of the aesthetic maxillary incisal edge. I would like to thank Dr.’s David Latz, Frank Graziano & Steve Ratcliff for sharing their knowledge, insights & passion with me on this subject back in the day at The Pankey Institute. It was truly a critical crux point in my journey.